You have a custom solution named SalesSolutron deployed to the URL http://site.contoso.com/sites/sales. You need to deploy a new version of the solution without retracting the previous version. *(box 1) The Update-SPSolution cmdlet upgrades a deployed SharePoint solution in the farm. Use this cmdlet only if a new solution contains the same set of files and features as the deployed solution. 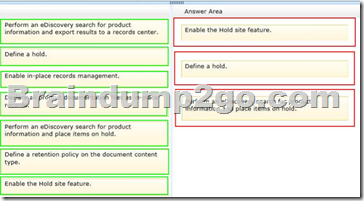 *(box 2) Identity Required Specifies the SharePoint solution to deploy. Specifies the path to the solution package. You install Microsoft Project Server 2013. You need to provision a Project web app instance in an existing web app in a SharePoint farm. You are designing a SharePoint search solution. 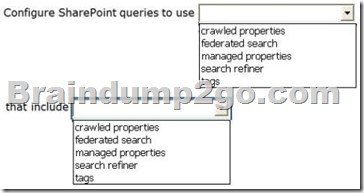 - Run search queries against specific SharePoint columns. - Run search queries against specific document properties. You need to ensure the search solution meets the requirements. * To include the content and metadata of crawled properties in the search index, you map crawled properties to managed properties. * A crawled property is content and metadata that is extracted from an item, such as a document or a URL, during a crawl. A crawled property can be an author, title, or subject. To include the content and metadata of crawled properties in the search index, you map crawled properties to managed properties. Managed properties can have a large number of settings, or attributes. These attributes determine how the contents are shown in search results. The search schema contains the attributes on managed properties and the mapping between crawled properties and managed properties. An organization is involved in a legal case related to one of its products. All documents related to this product are stored in a subsite of a site collection. The site collection has an existing policy to delete documents that have not been modified for four years. You need to configure SharePoint to ensure that relevant documents are NOT deleted by existing or future expiration policies. Box 1: Enable the Hold site feature. Box 2: Define a hold. * An in-place hold is a mechanism for placing content (SharePoint 2013 documents, list items, pages, and Exchange Server 2013 mailboxes) on legal hold while allowing users to continue working with the content and without them being made aware of the hold. If a user edits or deletes content that has been placed on in-place hold, the content is automatically moved to a special location thus preserving the state of the content as it was at the time the hold was placed. * In-place holds can be placed either at the site or mailbox level, or alternatively, you can use query- based preservation. With query-based preservation, you can define eDiscovery search queries and only content that matches your query will be preserved. 6. Production - Provide relevant content to opposition The SharePoint 2013 eDiscovery functionality focusses on the first three stages. - The project team members must be able to access files. - They must be prohibited from editing or deleting files. - They must not be able to change site permissions. - Create in-place holds on content stored in SharePoint and in Microsoft Exchange 2013. - Search for content and place holds based on the search query. An organization has a SharePoint intranet site. Documents and other files do not currently appear in search results until the day after they are uploaded to the intranet site.